This entry was posted in Sci&TechStudies(STS) and tagged causation, data analysis, prediction, statistics on July 3, 2014 by Peter J. Taylor. On days 11 & 12 we were hosted by Prof. Di Cook and her Research Group at Iowa State University in Ames, IA. The reason I wanted to learn more about the group’s dynamic graphical approaches to data analysis is conveyed in the start of the discussion paper I prepared for them (previously posted on this blog). During the two days we sat in on two classes, led a discussion of the paper, and met one-on-one with many members of the research group. The bottom line is that I wouldn’t that my hypothesis about “the various tools of interactive and dynamic graphics for data analysis [being] ways to address heterogeneity” was confirmed by these interactions. Except my host disagrees with that conclusion. Obviously more to think and talk about. Beautiful Visualization, ed. J. Steele et al., especially chapter on process of development of a visualization of a wikipedia entry. Information Visualization (InfoVis) is a large, well-rewarded field now. Practitioners combine stats, computing, and visualization (better than they did 20 years ago). This entry was posted in Sci&TechStudies(STS) and tagged data analysis, Di Cook, InfoVis, statistics, visual, visual hypothesis testing, visualization, Wickham on September 30, 2011 by Peter J. Taylor. While preparing to teach a course on epidemiology for non-specialists I made a websearch for a simple teaching example on the t-test for comparing the means (averages) of two groups for some measurement. 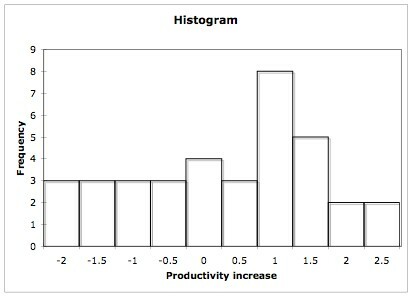 The first example I found compared the mean productivity for two groups of workers, one group of 40 workers averaging 4.8 (in some unspecified units) with a standard deviation of 1.2 and the other group of 45 averaging 5.2 a standard deviation of 2.4. Thinking about this example led me to articulate the sequence of thoughts and questions that follow about the foundations of statistical analysis. In particular, my inquiry explores contrasts between: the statistical emphasis on averages or types around which there is variation or noise; variation as a mixture of types; the dynamics (or heterogeneous mix of dynamics) that generated the data analyzed; and participatory restructuring of these dynamics in the future. A key issue is who is assumed to be able to take action—who are the “agents”—and who are the subjects that follow directions given by others. 3. There is something else I didn’t yet mention: in the original example there was actually only one workplace—the first group in the example is made up of workers measured on one day; the second group is made up of workers measured on a later day when the music was playing. The different size of the groups is simply related to different numbers of missing measurements on the two days. We could, therefore, look at the change in productivity for individual workers who were measured on both days. Suppose that we go back to the first example and find that this change averaged 0.5 with a standard deviation of 1.3 for the 36 workers measured on both days (Figure 2). The chance of a mean difference of this size if the workers actually came from the same population—that is, if music playing had no systematic effect on individuals’ productivity, whether good or bad—is 0.01… Given that the mean difference is positive, again the obvious thing to do is for the employer to play the music. 4. Yet, given that the mean difference is 0.5 and the standard deviation is 1.5, there must be many individuals who show a negative difference, that is, whose productivity declined when music was playing. In fact, this was the case for 12 of the 36 (see Figure 2). Should they oppose the playing of music, even though they are in the minority? If they do, should the employer ignore their opposition given that the firm’s average individual productivity increases? Does the employer have to power to ignore any opposition? If so, the employer’s power to switch on the music comes at the expense of one third of the workforce. In effect, the employer treats them as part of a music-enhances-productivity population, even though they don’t fit this type. 5. The employer, faced with competition from other firms and cognizant of obligations to shareholders, might justify playing music by pointing to the increase in average productivity of the workers, which translates into an increase in overall productivity of the firm. There are, however, other paths to higher overall productivity that the employer could consider. The employer might start by asking individuals in the minority why their productivity decreased when the music played. Suppose it turned out that the tasks of those whose productivity decreased required greater concentration than the tasks of their fellow workers, or that the music chosen is not to their liking. The employer might then rearrange the workplace so that music was not played in areas where workers had to concentrate hard. Or, using headphones linked to airplane-style audio-systems, individual workers might choose from a selection of musical styles. Once the employer starts consulting individual workers, the employer might go on to ask individuals whose productivity increase was well above the mean increase to explain why. It might turn out, for example, that the music countered the tedium of their work and made them less likely to take extended bathroom breaks. By learning about the different individuals, the employer is able, in effect, to dividing the range of individuals into a set of types in relation to working when music is playing. Actions taken by the employer can then be customized accordingly. Such actions might even lead to a higher overall productivity for the firm than switching on music for all. Of course, switching on music for all is simpler and probably less expensive, but it is a matter of empirical investigation whether the firm’s net profit would increase more through the customized changes or the simpler one-size-for-all action. 6. There are other things to consider about the one-size-for-all action by the employer. It keeps our focus on productivity in relation to playing music or not, and thereby keeps attention away from the dynamics (or mechanisms or causal connections) through which factors in addition to music influence productivity. We are left to hope that whatever the dynamics are, the addition of music does not lead to any long-term shifts in them. In other words, whatever dynamics generated the data we analyze, we assume that these same dynamics continue into the future even after playing music is added to them. Perhaps, however, a number of workers, including even some who like music, react negatively to the employer exerting the power to pipe in music, worrying, say, that this opens the door to advertizing, anti-union messages, and so on. Moreover, to some extent, a similar assumption about the continuation of past dynamics underlies the customized actions. For example, if headphones were used so as to allow choice of music, would the quality of intra-office communication continue as before? However, there is one difference between the one-size-for-all and customized actions. The latter, by acknowledging the range of circumstances underlying the increases and decreases in individuals’ productivity, opens the door to further attention to the dynamics through which factors in addition to music influence productivity. Of course, much more data is needed to investigate these dynamics and the employer might judge as unwarranted the cost of collecting and analysing the data and acting on any results. This entry was posted in Sci&TechStudies(STS) and tagged data analysis, heterogeneity, participatory processes, statistics, t-test on September 10, 2011 by Peter J. Taylor. Different kinds or combinations of factors are involved in what is deemed the same response. The challenge is to expose the factors and the ways they contribute to the response in question, if that is possible. • Consider the height a high jumper jumps. The athlete may use the classical approach to the jump and movements in the air or those of the Fosbury flop. This entry was posted in biomedicine, Sci&TechStudies(STS) and tagged data analysis, fluoridation, heterogeneity, PKU, statistics, underlying_heterogeneity on September 9, 2011 by Peter J. Taylor. Consider the concept of a regression line as a best predictor line. To predict one measurement from another is to hint at, or to invite, causal interpretation. Granted, if we have the additional information that the second measurement follows the first in time—as is the case for offspring and parental traits—a causal interpretation in the opposite direction is ruled out. But there is nothing about the association between correlated variables, whether temporally ordered or not, that requires it to be assessed in terms of how well the first predicts the second (let alone whether the predictions provide insight about the causal process). After all—although this is rarely made clear to statistics students—the correlation is not only the slope of the regression line when the two measurements are scaled to have equal spread, but it also measures how tightly the cloud of points is packed around the line of slope 1 (or slope -1 for a negative correlation). Technically, when both measurements are scaled to have a standard deviation of 1, the average of the squared perpendicular distance from the points to the line of slope 1 or -1 is equal to 1 minus the absolute value of the correlation (Weldon 2000). This means that the larger the correlation, the tighter the packing. This tightness-of-packing view of correlation affords no priority to one measurement over the other. Whereas the typical emphasis in statistical analysis on prediction often fosters causal thinking, a non-directional view of correlation reminds us that additional knowledge always has to be brought in if the patterns in data are used to support causal claims or hypotheses. This entry was posted in Sci&TechStudies(STS) and tagged correlation, data analysis, heterogeneity, regression, statistics on September 8, 2011 by Peter J. Taylor. Understand the simple chain of thinking below, then enlist or hire a statistician who will use the appropriate recipe for the data at hand. 2. Variation: For some measurable attribute, the individuals have varying responses to these causes (possibly because of the background causes). 3. You have observations of the measurable attribute for two or more subsets (samples) of the populations. 4. Central question of statistical analysis: Are the subsets sufficiently different in their varying responses that you doubt that they are from the one population (i.e., you doubt that they are subject to all the same foreground causes)? Statisticians answer this question with recipes that are variants of a comparison between the subset averages in relation to the spread around the averages. For the figure below, the statisticians’ comparison means that you are more likely to doubt that subsets A and B are from the same population in the left hand situation than in the right hand one. 5. If you doubt that the subsets are from the same population, investigate further, drawing on other knowledge about the subsets. You hope to expose the causes involved and then take action informed by that knowledge about the cause. Variation around a mean is not a strong sense of heterogeneity. The emphasis above is on the means (the circles) more than the variation (the dashed curves). Statistical analysis distinguishes types (or decides they are not distinguishable) more than it explores the variation (or error, i.e., deviation from type). Data amenable to a t-test are, however, open to alternative explorations, as illustrated by the final vignette in this series of posts. This entry was posted in Sci&TechStudies(STS) and tagged data analysis, heterogeneity, statistics on September 7, 2011 by Peter J. Taylor.